Traditional scuba certification classes teach you the mechanics of diving. We do that, but we do so much more. All dive training at Blue Endeavors focuses on the joy of diving and the thrill of being underwater, but each of our classes also focuses on topics such as marine biology, ocean conservation, research diving, and marine archaeology. What sets us apart is that when you train with Blue Endeavors, you aren’t just getting a certification card, you are developing into a citizen scientist and becoming part of a community committed to understanding and conserving our oceans. Blue Endeavors offers projects above the surface as well. 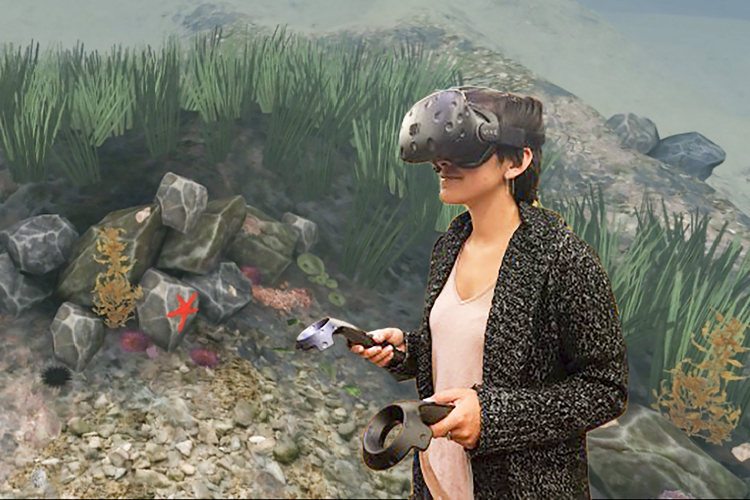 The above photo is from a Stanford Woods Institute study on the use of virtual reality to impact real world behavior that our students participated in as subjects. We are also underway for projects such as reef healthy sunblock, and an app based guide to spend tourism dollars in countries that support ocean conservation. One reason that ocean conservation has not received more attention, national, and international funding is because hereto it has been difficult to collect data sets for research questions. However, because we are living in a time of exponential growth of the Internet and the development of powerful new cognitive tools, we are standing on the cusp of new scientific discovery. Whether these discoveries take the form of building and deploying ROVs, participating in indicator species counts for marine protected areas, or photographing giant manta rays to chronicle migration patterns, Blue Endeavors citizen scientists add to the collective knowledge of our planet and powerful and meaningful ways.